← Pony News: Tony Fleecs is Guest Of Honor at the final BronyCon! Ugh tax day. But I’ve got a bit of happy time for you! Ready to get yourself some Ugly? 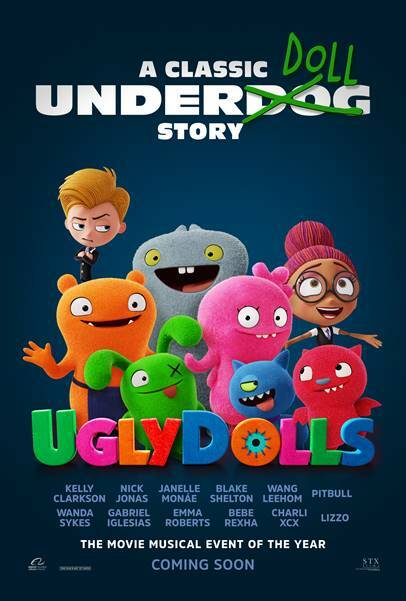 Because those adorable Uglydolls are coming at you in their self-named film! Synopsis! In the adorably different town of Uglyville, weirdness is celebrated, strangeness is special and beauty is embraced as more than meets the eye. After traveling to the other side of a mountain, Moxy and her UglyDoll friends discover Perfection — a town where more conventional dolls receive training before entering the real world to find the love of a child. Soon, the UglyDolls learn what it means to be different — ultimately realizing that they don’t have to be perfect to be amazing. What: ADMIT TWO passes for the B’more screening of Uglydolls! Why: Uglydolls are freakin’ adorable! Remember: seating for screenings are first come first served and not guaranteed. So get there early to get yourself a seat. This entry was posted in Free Screenings and tagged Baltimore Screenings, Free Screenings. Bookmark the permalink.